I was REALLY tired of the fake flower forsythia wreath from the JoAnns clearance sale going up on my front door every spring. I started looking around on my favorite blogs, and checking out Pinterest to see what inspiration I could find. This first one is from Lucy at Attic24. Hands down my favorite UK Crochet gal. 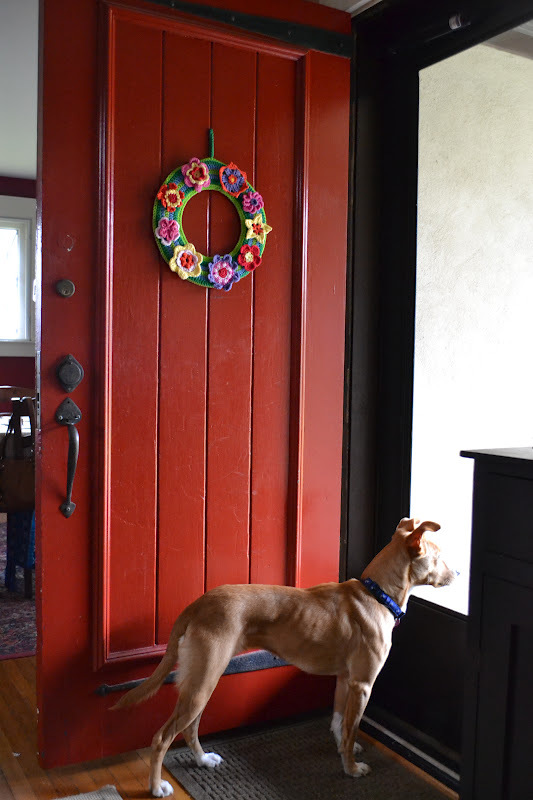 I loved everything about her sweet little wreath EXCEPT the size. 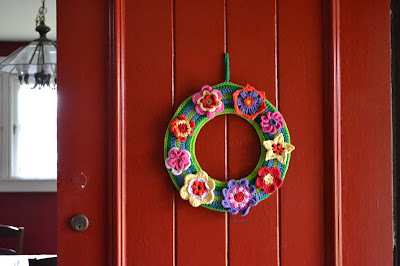 Not that a 6" wreath wasn't perfect for where she hung it, but my front door required something bigger. This other one is from an unknown source. I found it on pinterest and did my best to trace it back to its original source with no luck (I am not a fan of unsourced pinterest photos). I apologize in advance to its original creator and would LOVE to offer credit for the beautiful design. 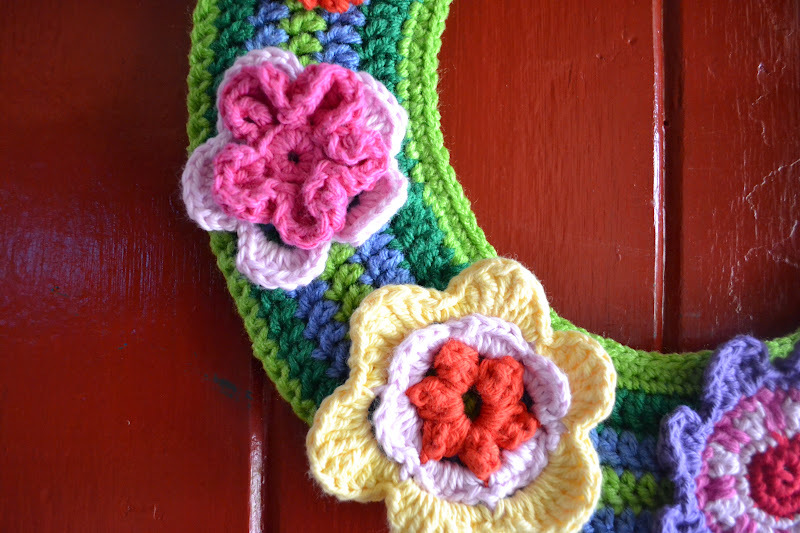 One thing I liked about this second wreath is all the different flowers. However, the pastel colors wouldn't look as good on my front door and I didn't really want to add any leaves. I liked the way Lucy's wreath showed some of the actual wreath as well. So, I went to work adapting a larger wreath using Lucy's FREELY SHARED (Thanks Lucy!) pattern from her blog. 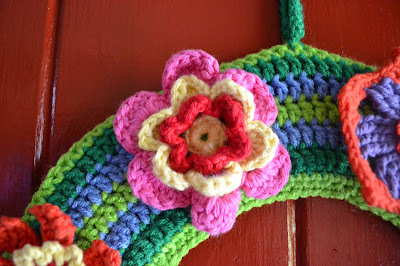 To make my larger wreath, I used 3 colors of I Love This Yarn that I bought online from Hobby Lobby. I wanted to use cotton but I didn't have any appropriate weight cotton yarn that had the vibrant colors I was looking for. So, I went with this acrylic. After a bit of trial and error, here is the pattern that I used to create the larger sized wreath base. 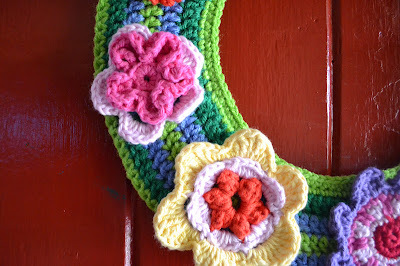 My wreath measures about 13" in its finished size after the front and back of the wreath have been stitched together. 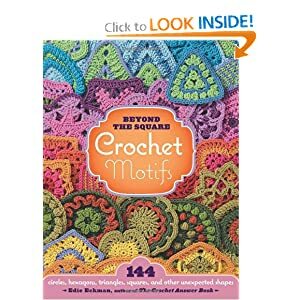 All instructions are in American Crochet terminology. 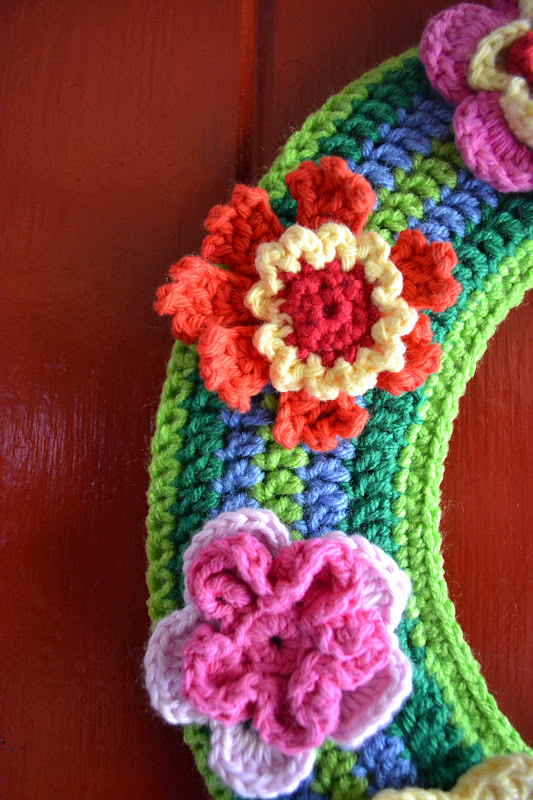 To make ONE SIDE of the wreath, crochet 96 chains. Then, dc (in the 3rd chain from the hook). dc in the next 5 stitches. 2dc in the next stitch. *dc in the next 6 stitches, 2 dc in the next stitch, repeat from * to the end of the row of chains. You will notice that you can now form a soft circle with your strand of crochet as the 2dc in the same stitch make it turn slightly circular. 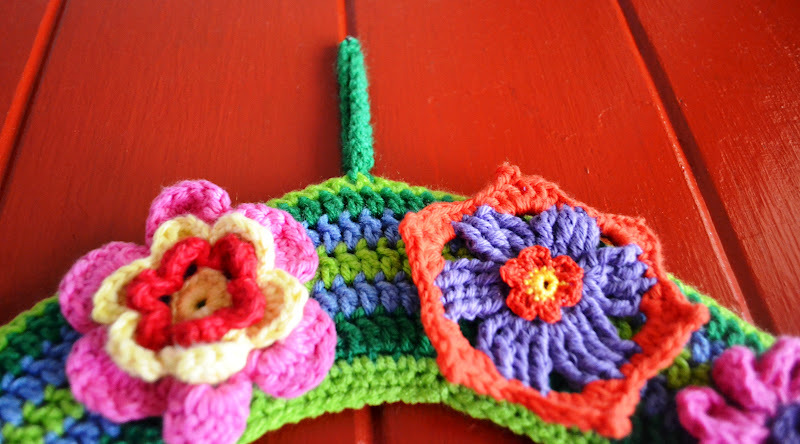 Slip stitch to join the strand into a circle. I then also threaded the tail onto a big needle and wove the end in so that both the top and the bottom of the dc row were smoothly attached into a circle. For my wreath, I changed colors at this point to continue, but you don't have to. Chain 3 (after joining new color if you're changing colors) which counts as a dc. dc in the next 9 stitches, 2 dc in next stitch, *dc in next 10 stitches, 2 dc in next stitch, continue from * to end of circle. Join new color here or continue in same color. Chain 3, dc in the next 15 stitches, 2 dc. *dc in the next 16 stitches, 2 dc in the next stitch. Repeat from * to end. Join new color here or continue in same color. Chain 3, dc in the next 19 stitches, 2 dc. *dc in the next 20 stitches, 2 dc int he next stitch. Repeat from * to end. Join new color here or continue in same color. Chain 3, dc in the next 23 stitches, 2 dc. *dc in the next 24 stitches, 2 dc in the next stitch. Repeat from * to end. Slip stitch to finish the front of wreath. 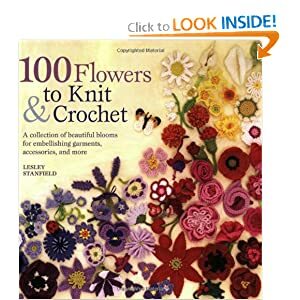 To create the flowers, I played around in 3 crochet books and experimented with different flowers. I made all the flowers using a worsted weight of cotton yarn. I used a combination of I Love This Cotton from Hobby Lobby, Lion Brand cotton yarn and Sugar and Cream yarn by Lily. I combined several big flowers with several small flowers to create some double and triple decker flowers. I cannot reprint the patterns for the flowers I made specifically because I got them from books and don't want to infringe on those copyrights. Here are the books that I used. Go to book 1 on amazon here. Go to book 2 on Amazon here. Go to book 3 on Amazon here. I bought mine on Amazon but my local library does carry two of the three, so check out your library to test drive them first. 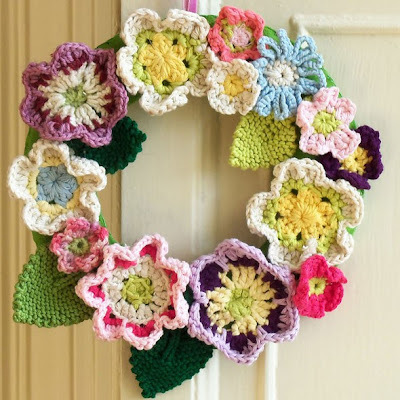 I also checked my pinterest board called Crochet Lovlies Motifs which is loaded with fabulous flower motifs attached to patterns from crochet bloggers and craft sites. 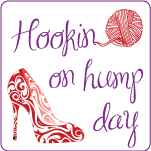 Check out that pinterest board by clicking HERE. Once your wreath front and flowers are complete, lay the flowers out on your wreath front and arrange them the way you like them. I used T-pins to hold the flowers in place. 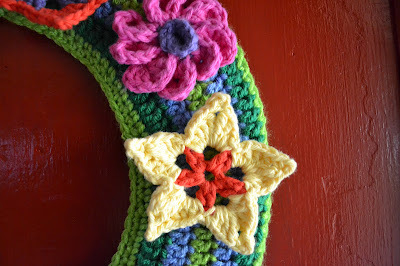 I used pearl cotton to attach them to the front of the wreath and knotted them in the back to remain in place. 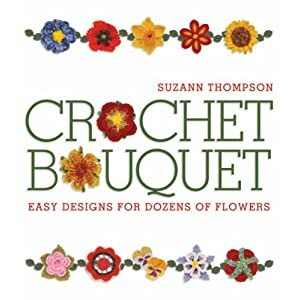 You may need to block or flatten or iron (press with steam only if using cotton) your flowers before you attach them. Mine seemed to lay reasonably flat, so I didn't. Create a wreath back the same way you made the front. Weave in the ends of both the front and back of your wreath pieces. Next, go to your recycling bin and look for a piece of cardboard. I used a cereal box. Cut a donut shape from your cereal box. I traced around my wreath front with my pencil pointing inward so the cardboard donut was a bit smaller than the wreath. At this point, put your two wreath sides with wrong sides together and the cardboard donut in between and use a sc to "stitch" together the two sides. 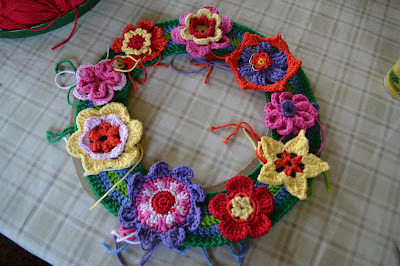 I started with the outside circle of the wreath but think it might have been easier to start with the inside. I also added an additional row of sc to the inside circle when stitching together but that's just because I liked the look. I crocheted a row of about 20 chains. 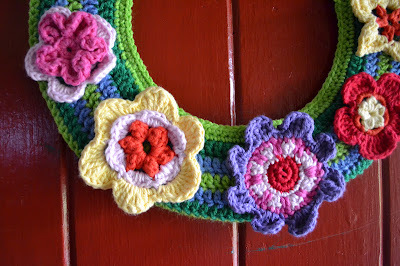 Then, I sc in each chain and attached that to the top of my wreath as a hanging loop. You could probably incorporate the hanging loop into your row of sc joining stitches, but I sort of forgot that detail until I'd crocheted it all together. 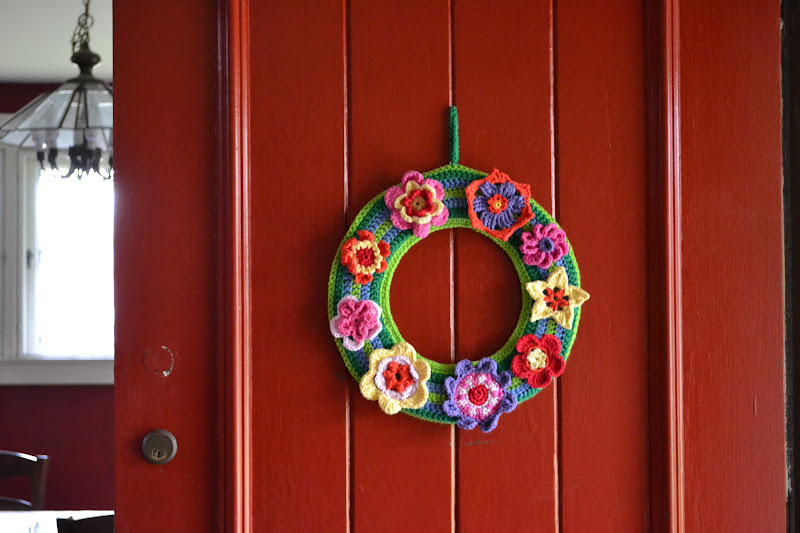 In addition to a cardboard structure on the inside, you could use a piece of circular foam, a coat hanger or even some stuffing depending on the look you want to achieve with your wreath. 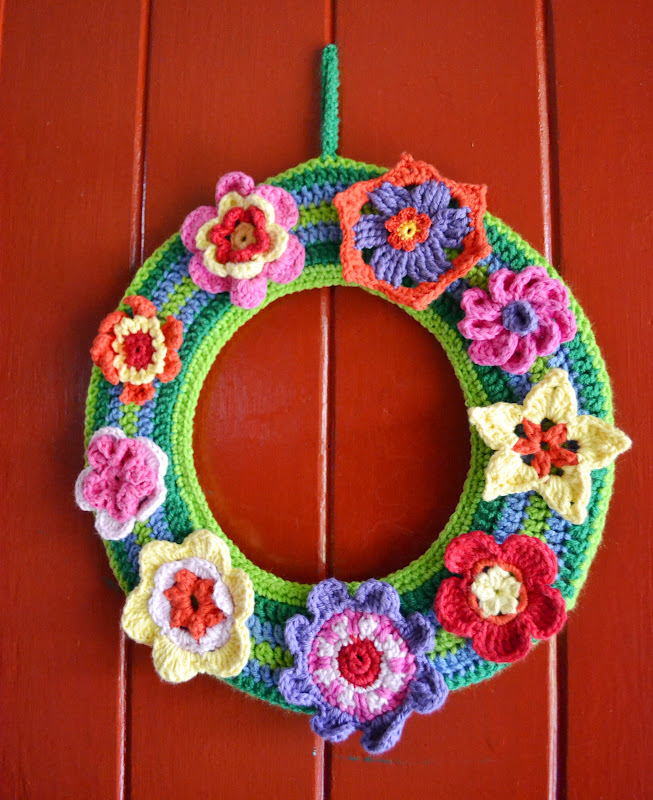 I hope my instructions were clear and if you DO make a wreath inspired by my creation, feel free to share it on my FB Page by clicking here and uploading your photo! PS - apparently, the dog was much less impressed my wreath than the she was with the squirrel that was on the front porch! I'm going to go pin it right now to my crochet board on pinterest! I have a wreath that size in mind for summer, swathed in roses and other summery blooms. I love the mixed bouquet on yours, sooooo pretty! Here is a good way to find unsourced Pinterest photos. Not a good thing people! Pin properly! Thanks for the lovely comments. Also thanks for the tips on how to find image sources. I tried your method without any success on my image in question. Many of the other suggestions from the commenters on your blog were confusing, so I didn't try those. The image for now will remain unsourced but if any computer whizzes can find the source I'll be happy to update my post. 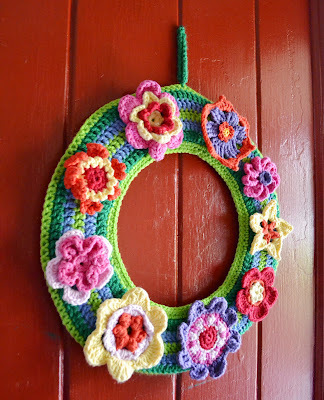 This wreath is totally awesome! This is a very fun looking wreath. I must attempt to make one. 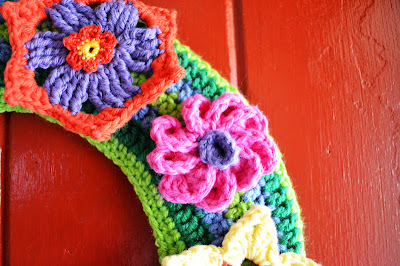 I been so inspired by the crochet bloggers! 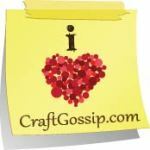 I am joining you from Sew Darn Crafty Party! Hope you visit me? I really like that you wrote up a little tutorial for this, so Thank you! 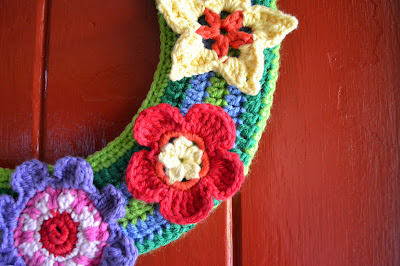 What do you think about putting this up on Ravelry? I would love to link to my project that way. how lovely!! glad to see this! Thanks for the lovely comments. Also thanks for the tips on how to find image sources. I tried your method without any success on my image in question. Many of the other suggestions from the commenters on your blog were confusing, so I didn't try those. I appreciate the effort you did in compiling such number of blogs. 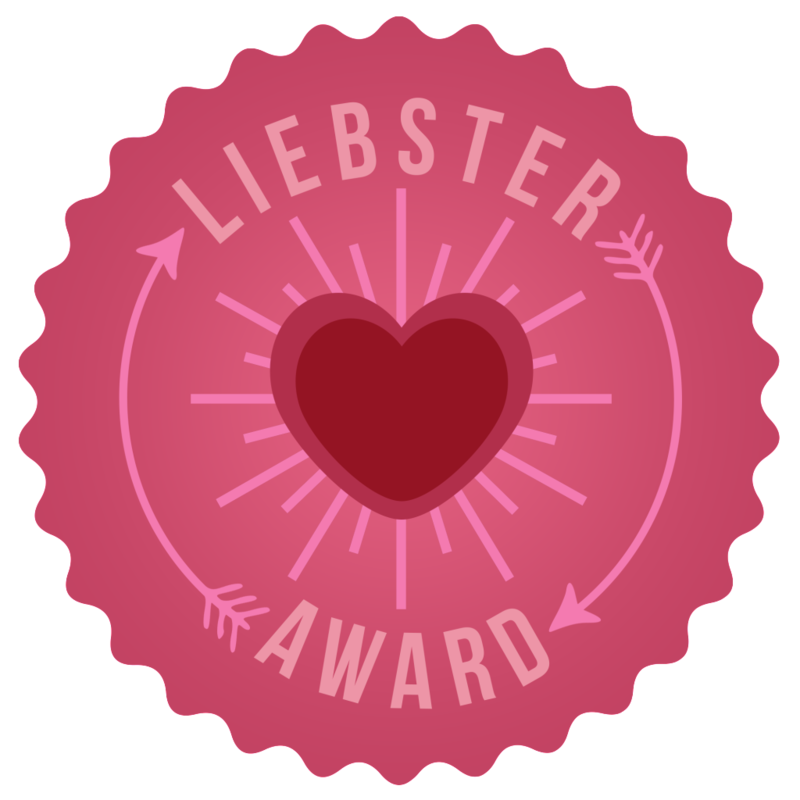 I just commented on some post from your list. I really had a great time reading them. I was featured top 3- YAY! 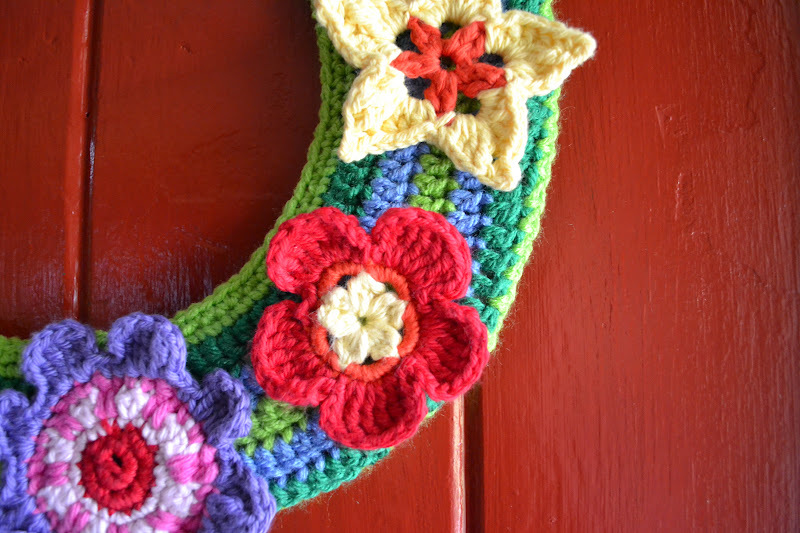 Double Crochet Wreath Instructions - WINTER!